We stumbled upon an archive of old, unlabeled UB photos that prompted us to do a little sleuthing, and we need your help. Do you know the people pictured in this image? Do you know when or why this photo was taken? Fill us in: Email the Office of Alumni Relations or call 410.837.6131. The old photo featured in our last issue generated several responses, not to mention a lively debate about the identity of the now-famous backflipper. Our thanks to everyone who weighed in; we hope you'll share more stories about future photos. Read on to take a quick trip back in time to the UB of the ’70s, courtesy of your fellow alumni. During my years at the “Hive,” 1972-77, near the end of the spring semester, a block party was held. The drinking age was 18, the Vietnam War was winding down and most of our college social life revolved around events off campus. The Famous Ball Room, soccer, lacrosse and baseball at Speer Field on the “Mt. Washington Campus,” the unofficial frat above the Wigwam on Charles Street and “Spar’s” (the old and real Mt. Washington Tavern) were all used for social events by students, athletes, co-eds from other schools and fans. The block party was the only nonathletic event that brought students together, en masse. This spring block party, ’73 or ’74 (? ), was held on [the] closed Lanvale Street between Maryland Avenue and Charles Street, directly in front of the famous campus eatery, Little Ceasar’s. Notice the fence preventing our students from wandering into the Jones Falls Expressway traffic. In the background is the old post office motor-pool facility. Another year, the block party was held on the “Goodyear” lot, which was behind the motor pool. The Goodyear lot was notorious for illegally parked student cars that led to classroom disruptions as the “towing on the Goodyear lot” alert was sounded throughout the campus. The cars in the background on Maryland Avenue were strategically parked for free as the motorcycle cop left his perch at 8:55 a.m. on one side (parking from 9 a.m.-4 p.m.), in time [for students to] to park and make the 9 a.m. class on Mondays, Wednesdays and Fridays. Same for the other side, but [it] was only helpful on Tuesdays and Thursdays for the 9:30 class (parking from 9:30 a.m.-4 p.m.)—no undergrad student would ever give up sleep and arrive a half hour early on [a] Monday, Wednesday or Friday. I recognize Mike Cosgrove of the 1975 college division national champion soccer team; he’s behind, closest to the right of the flipping #12 (tallest, dark hair, long pants). It’s very possible the flipping student is Jerry Meyers of the same championship team. Jerry and his brother Charlie were both known for their acrobatics in celebrating goals and victory. Those were good times. Thanks for stirring the memories. Pictured far right with beer in hand is Leon Mach of the UB NCAA soccer championship team 1975. Next to him is Gary Ignatowski (J.D. ’81) (JHU); next to him is Mike Cosgrove (B.S. ’77), also of the NCAA team in ’75. Doing the flip is John Koenig from UB's '75 championship team (a guess). I believe the person on the far right in the picture is Charley Myers (B.S. ’77) (U of B soccer hall of fame member). The third person from the right is Mike Cosgrove. I am not sure of the person doing the flip, but Charley Myers’ brother (“Worm”) was known for his flips and gymnastics. It could be him? The guy doing the flip is not Charley Myers’ brother, but I think it is “Worm,” Jerry Schmith’s brother. It looks like a UB block party. The guy sitting on the curb with the sunglasses looks like Bill Woodard, who eventually became the sports information person at UB for quite a few years. This was on Oliver Street by Little Caesar’s at a block party, either fall or spring (not sure of the year). 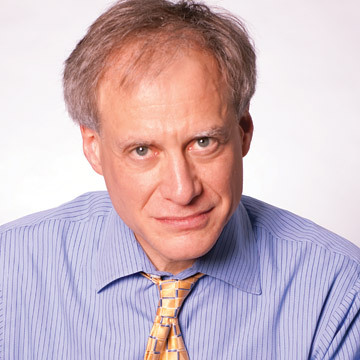 Jerry Myers (B.S. 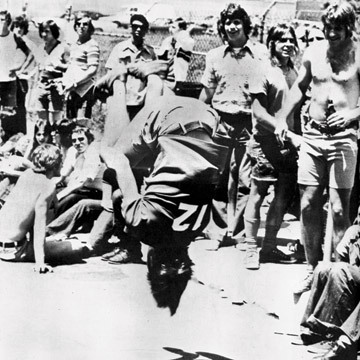 ’70) is performing the flip. Brother Charlie (without shirt) is watching big brother. Directly to Charlie’s left is Hopkins student and soccer player Gary Ignatowski. Left of Gary is me. The eyes over Charlie’s shoulder are Ron Schmith (B.S. ’76), also a U of B grad. Charlie, Jerry Myers, Ron Schmith and [I were] members of the 1975 national soccer championship team.